Keystone retaining walls are an excellent choice for a home that needs excavation and load bearing retaining walls. The Keystone system is engineered to withstand the test of time. 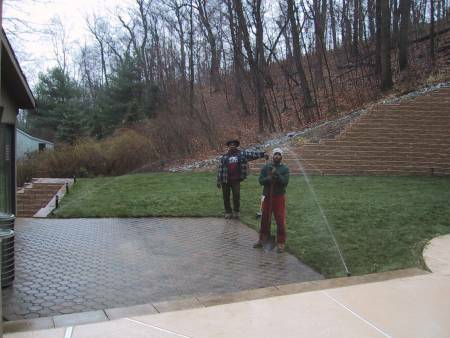 This home required major excavation to accommodate a swimming pool in the rear yard which backed up to a steep slope. An application such as this requires plenty of excavation and drainage for the retaining wall system. Bobcats for Hire utilizes an automated process when building a Keystone wall. This helps to save on labor and ensures that the correct amount of stone is always used in the backfill of the installation. Stone is used for drainage to prevent water from adding to the weight of the soil behind the wall and preventing lateral forces from leading to wall failure. Drainage is very important on any retaining wall system, and especially important as the wall height rises above three feet. An adequate drainage system will ensure that your retaining wall will last for future generations to come. At this steep slope site, many contractors told the homeowner that this patio installation could not be installed due to the retaining wall configuration and difficult access leading into the rear yard. Our track loaders and owner-operator nature of our business made this project possible which also included the sprinkler system, drainage, and sod as well. Digging into a slope to provide more level land alters the course of the underground water flow. By designing an appropriate drainage system for a retaining wall, one can be assured that their new landscape and level area will in fact be useable following the construction of the retaining wall. All too often, drainage is an afterthought and results in a finished project that looks like this one (right and below). 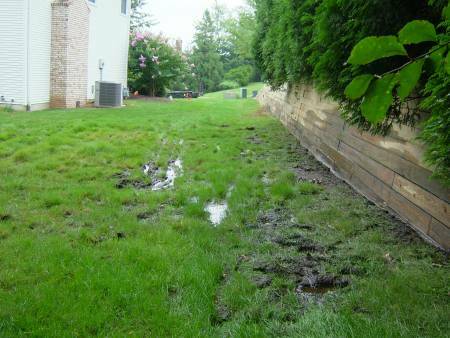 This wall had been built by a hack and did not incorporate the necessary drainage system behind the wall to prevent damaging ground saturation to the lawn areas. Of course it is much more work to install the correct drainage system after the wall is built, but in this case, that is what needed to be done. Be smart and insist that adequate drainage is designed for your project at the planning stages of your project. This is the time that it is least expensive to install. Installation of this system after the wall is built involves more work and cost that can easily be avoided with proper planning. Digging into a slope to provide more level land alters the course of the underground water flow. 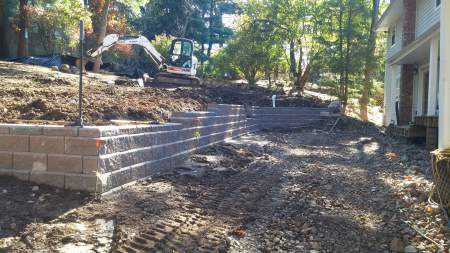 By designing an appropriate drainage system for a retaining wall, one can be assured that their new landscape and level area will in fact be useable following the construction of the retaining wall. All too often, drainage is an afterthought and results in a finished project that looks like this one pictured to the left. 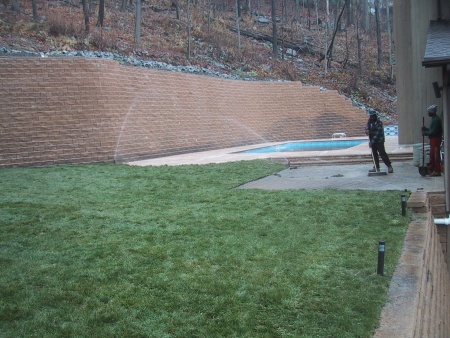 This wall had been built by a hack and did not incorporate the necessary drainage system behind the wall to prevent damaging ground saturation to the lawn areas. It is much more work to install the correct drainage system after the wall is built, but in this case, that is what needed to be done. Be smart and insist that adequate drainage is designed for your project at the planning stages of your project. This is the time that it is least expensive to install. Installation of a drainage system after the wall is built involves much more work and cost that can easily be avoided with proper planning at the beginning of the project.